Google Instant Search Feature is released by Google, and Google is a search giant – and there is no doubt saying about that when Google was planning to launch its search tool there were many other giants already exist like altavista, lycos and yahoo in 90’s when Google launched its search tool then it became a world leader in search. 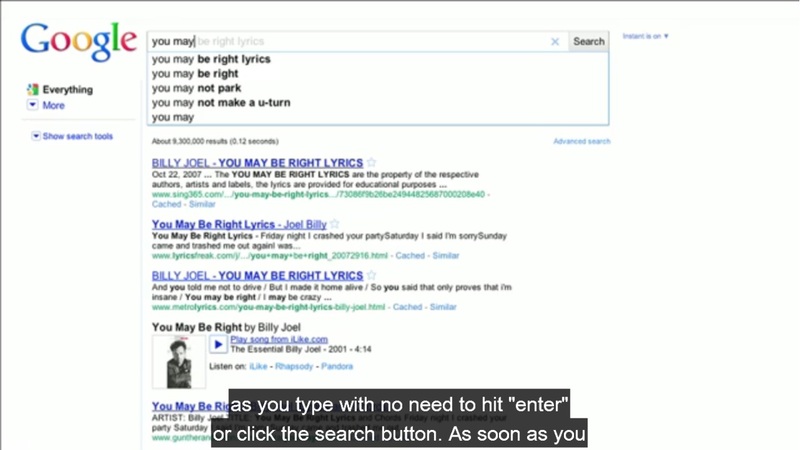 Google recently added a search enhancement in its search tool that is to save your time when searching for things, Normally it takes 9 second to type a search query as per Google research and sometimes it took 90 second and with Google instant search feature it can safe 2-5 second to type single query. Imagine demo -as you type query it will give you related text- before typing your text will be displayed. Another fact about Google instant Search feature is – you can turn this feature off if you don’t like this, just click preference page. Google instant Search feature is rolled out to US, UK, France, Germany, Italy Spain and Russia and only for people using chrome, IE8, Firefox v3, Safari v5 for MAC. And if you are in India or Ghana or other than the countries mentioned above – you can not use this feature you need to log in to Google account to access this feature. Google instant search is not available for mobile user so please use office pc or desktop one. Please leave comments if you like this feature because Google engineer has done a lot to develop this feature – they might get a kind of feedback on this feature to enhance it further.